The nose gear of Stratolaunch's aircraft briefly left the ground during the latest taxi test of the giant airplane Jan. 9 at Mojave Air and Space Port in California. SEATTLE — The latest taxi test of the giant aircraft being developed by Stratolaunch for its air-launch system is a sign the plane's first flight may take place soon. The company announced Jan. 9 that its airplane, the largest in the world by wingspan, performed its fastest taxi test to date at the Mojave Air and Space Port in California, reaching a top speed of 219 kilometers per hour. That test also featured a "rotation authority maneuver" that briefly lifted the plane's nose gear off the ground. During a briefing with reporters in April 2018, company officials said they were planning three more taxi tests before attempting the plane's first flight. That final taxi test, they said then, would reach a speech of about 220 kilometers per hour. At the time, Stratolaunch expected to be ready for a first flight of the aircraft in the summer of 2018, and hasn't disclosed reasons for the delay. There was industry speculation that Stratolaunch might attempt a first flight before the end of 2018, but the year ended without signs of an impending flight. Once Stratolaunch's plane is finally airborne, it will begin a new phase of the vehicle's test program. The company said last year that it expected to take 18 to 24 months to complete that test flight program and receive an airworthiness certificate from the Federal Aviation Administration before the plane would be ready to serve as an air-launch platform. 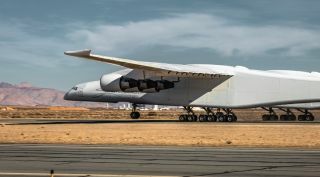 Stratolaunch plans to initially use the plane for launches of Pegasus XL rockets provided by Northrop Grumman Innovation Systems. The plane will be capable of carrying three rockets on each flight, mounted on wing pylons between the plane's twin fuselages. The company, though, is creating its own launch vehicles that can be carried by the plane. The Medium Launch Vehicle, capable of placing 3,400 kilograms into low Earth orbit, is scheduled for a first launch in 2022, the company announced last August. The company also has plans for a heavier variant of that vehicle to place 6,000 kilograms into orbit, as well as concepts for a crewed spaceplane. Those vehicles will be powered by an engine called PGA that Stratolaunch is developing. That engine, using liquid oxygen and liquid hydrogen propellants, will produce 200,000 pounds-force of thrust. Stratolaunch announced in November that it successfully fired the engine’s preburner in tests at NASA's Stennis Space Center in Mississippi. The engine takes its name from the initials of Paul G. Allen, the billionaire founder of Stratolaunch who passed away in October. At the time of his death, executives with Vulcan, Allen's holding company for his various ventures, said that he "thoughtfully addressed how the many institutions he founded and supported would continue" after his death, but offered no specific details on the future of Stratolaunch beyond a lack of near-term changes.